We are huge fans of Apologia Educational Ministries and the products they produce! When most people hear Apologia’s name mentioned they immediately think of their award winning science programs for elementary through high school. But did you know that they also offer Christian worldview curriculum too? Over the last few years, the girls and I have had the pleasure of using and reviewing several curricula from their worldview products and now we have been given the opportunity to review the three newest books, Old Testament iWitness, New Testament iWitness, and iWitness Biblical Archaeology, in the iWitness series and I am equally thrilled! Second to science, history is one of the subjects I love to teach. To learn about the past and how it applies to us now, in the present day, has always fascinated me. So, imagine my surprise when I found out I was selected to review the three new Apologetic books Old Testament iWitness, New Testament iWitness, and iWitness Biblical Archaeology. Let me tell you a little bit about this series. Each of the books is written and designed by Doug Powell who self taught himself computer graphics and animation while also holding a Master of Arts in Christian Apologetics from Biola University. Through the iWitness series he was determined to present the scholarly biblical material of the old and New Testament and biblical archaeology in a fun and visually appealing way. 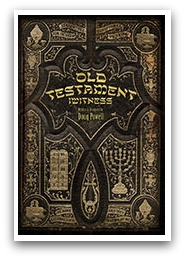 Old Testament iWitness ~ How is the OT different from the Hebrew Bible? Who authored these ancient books and where? These are just a few of the answers that are answered in this book along with the history of the Old Testament and how the books were chosen. 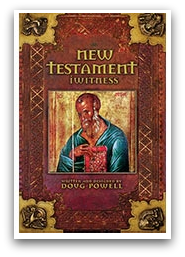 New Testament iWitness ~ lets you, the reader, sort through the evidence and become lead investigator into who wrote the NT. This book also details the books that were rejected and the process of copying and preserving the documents. It also explains how we can know we are reading an accurate version of the original text. 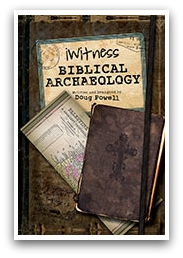 iWitness Biblical Archaeology ~ takes you on an exciting journey through the major archaeological digs to experience first hand some of the most important finds that validate the truth of Scripture. The names, events, places, and times all confirm the events mentioned in the Bible as God revealed himself to the world. Each of the 9" x 6" books is designed as stack of documents the reader has to decode and make sense of. The reader is challenged to think and sort through the logical trail of information, just as if they’re doing their own investigation instead of being told the facts. For this reason the books are written to those 11 years and up. Retailing for just $14.00 each these three books are a valuable asset to any book shelf. These books have been easy to incorporate into our homeschool day. When they first arrived I read through them all in the first night and eagerly shared the information with my husband, Mr. M. We especially enjoyed the iWitness biblical archeology on the Dead Sea Scrolls since we had an opportunity to see them on exhibit about 7 years ago. I really enjoyed sharing the pictures of Noah's Ark and Egyptian Chronology with Montana (8) & McKenzie (5). The modern day pictures helped to tie in the well known stories and to give them a visual of the Mummy of Rameses II. The other girls (17,13, &11) just read through the books and asked questioned. We did have a rather thought provoking discussion on Egyptian Chronology and the Pharaohs who lived at that time. If I had to choose a favorite book of the three it would definitely be the iWitness Biblical Archaeology book! The pictures included have a way of drawing you in and make you want to know more and more. My only complaint, which is not anything major, but some of the different fonts are a bit difficult to read. I understand the fonts selected are for visual appeal and to give the feel of a journal, I just felt some were harder than others, especially in the Old Testament iWitness. Maybe it’s just my eyes getting older. However, this did make me slow down and really take my time with what was written. Overall, I am completely pleased with all three of these books. Mr. Powell nailed it with these three books and I can't wait to get my hands on the two newest books that have just been released, Jesus iWitness and Resurrection iWitness. If you are looking for an in-depth Christian apologetics, then look no further than the iWitness series from Apologia. I know you will be pleasantly surprised by the amount of information presented in these books. Be sure to check out what my CrewMates thought of these books by clicking the banner below.